Looking for the best beach clubs in Marbella? With so many choice it’s often hard to decide were to go. We have made a selection for you of the Top 3 Beach Clubs in and around Marbella, enjoy! Nikki Beach Marbella has a great location directly on the beach in Marbella East and is a welknown worldwide brand with luxury locations in for example Mallorca, St Tropez, St Barths, Ibiza, Miami etc. The beach club comprises of a swimming pool with VIP beds on a raised deck, a large open air restaurant, a centrally located octagon-shaped bar, a Lifestyle Boutique and a VIP terrace with spectacular views of the Mediterranean Sea. Get an impression of Amazing Sundays in this Video! Ocean Club Marbella is the original classic beach club in Marbella and is located in Puerto Banus. 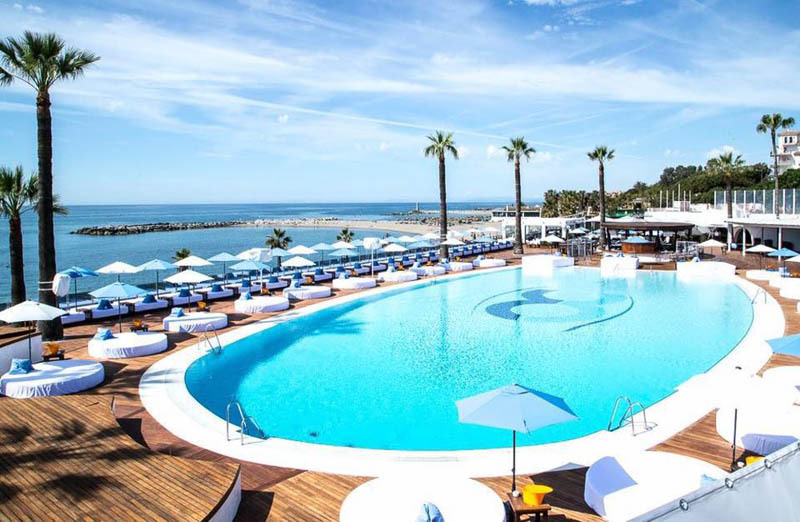 Ocean Club is a reference for style, modern luxury and an atmosphere that has made it famous as one of Europe’s chic favourites for relaxing, partying and enjoying the best that summer has to offer. It all happens around a huge saltwater pool, where super-comfortable, extra large sun beds are ranged on a beautiful pool deck overlooking the sea and pool. The restaurant at Ocean Club offers a fine dining experience overlooking the sea. Partly covered and partly al fresco, it catches cool sea breezes as you soak up the club’s atmosphere whilst also being able to enjoy a little privacy in a stylish environment where fine food and service reign supreme. Take a look at this Amazing Opening Party Video! Purobeach Marbella is located on the beautiful beach with 100 sunbeds placed right on the sandy beach facing the sea where you can enjoy spectacular views of the Gibraltar rock and the Moroccan Atlas mountains. The Pool with the distinctive Puro Mandala base surrounded by the sunbeds and 3 nomad beds on the terrace is an icon for the brand. Getter a better impression with this fantastic Video! As you could see in the videos these beach clubs always offer various themes every season. The absolute favorites are the opening & closing parties! What is your favorite Beach Club in Marbella?